Two coronal mass ejections, both with erupting prominences, were recorded within one hour of each other by the SMM Coronagraph. 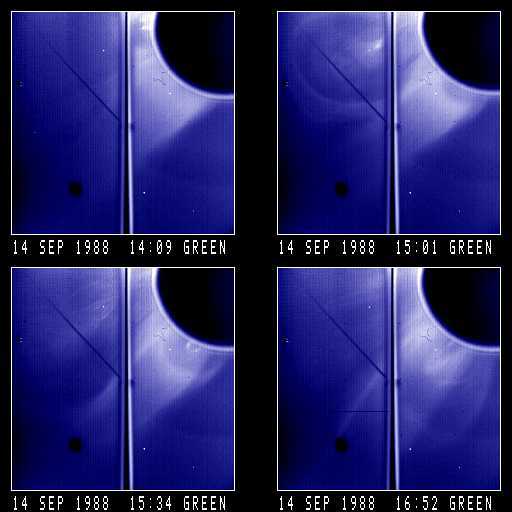 The first ejection is visible at the very top of each frame; the second ejection occurs to the south of the first and disrupts the coronal `helmet' streamer. Solar north points to the upper left of each frame and the east equator points toward the lower left corner of each frame. Loop/cavity with highly structured (prominence) core. Loop is `light-bulb' shaped from 15:04 until 15:37 UT. Big deflections. Loop/cavity and core are out of the field of view by 16:29. A series of ejections of irregularly shaped material follow at 16:54, 20:02 and 01:00 UT. Loop/cavity with highly structured, loop-shaped (prominence) core in streamer. Deflections. Streamer is blown out.